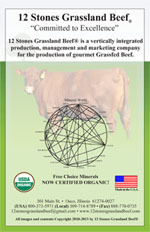 12 Stones Grassland Beef® is a vertically integrated production, management and marketing company for the production of gourmet Grassfed Beef. Why Have Supplements for Grass Fed Cattle? 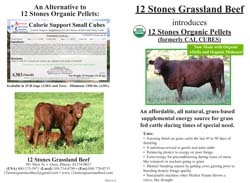 12 Stones Grassland Beef® and Advanced Biological Concepts® have teamed up to supply nutritional tools for the grass cattle industry to maximize animal health and forage utilization. It is our goal to provide help when the restricted environment does not supply what an unrestricted grazing environment could for a complete nutritional profile. Soil and forage management are making great advances and are a primary way to achieve your grass management goals. Our goal is to provide tools that we have found to be needed to overcome adversity that is a normal part of life and nature. Animal health and nutrient dense food need not be compromised because of that adversity. Our products are grass-based and all ingredients fit the natural grass source nutritional standards for grass finished beef. Beef cattle are starvation resistant animals that have been a tool to market by-products and waste for years. The move toward grass finished beef has been motivated by nutritional research clearly defining differences in biochemical composition of meat based on nutrition and management. Our goal is to assure the nutrient density of grass fed beef is all that is can and should be despite fluctuations in environmental conditions. A healthy, pleasurable eating experience is critical for the grass finishing industry to assume its rightful role in American Agriculture.